This is the classic AID EliSpot Reader type. The device is fast, efficient, user-friendly and has become one of the most successful EliSpot Reader Systems on the market. The AID Classic interprets any type of 96 and 384-well plates, including all brands of membrane type plates, ELISA-style plates and low volume plates. It simultaneously takes high resolution images, auto-centers the well, counts/analyzes plates and exports data in various formats. 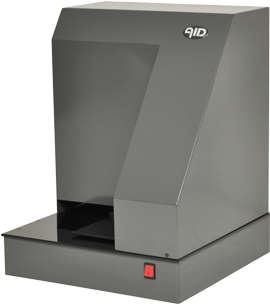 The AID iSpot is the most successful EliSpot/FluoroSpot Reader. 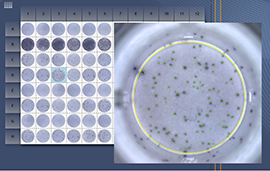 The AID iSpot allows analyzing both: Enzymatic and fluorescent (FluoroSpot) based EliSpot assays. Besides the outstanding functionality of the AID Classic, the AID iSpot allows to analyze 1-, 2- or even 3-color FluoroSpot assays. A simple “one-click switch” between enzymatic and fluorescent mode, without the need of hardware changes, is enough to switch from one mode to another. The “fluoroAID” image overlay technology permits exact detection of cells secreting multiple cytokines. Count results and all other parameters can be exported in various formats. 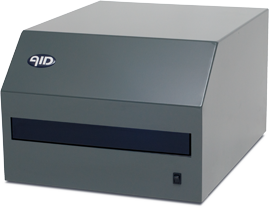 The AID iSpot Spectrum is the newest generation of the successful AID iSpot. 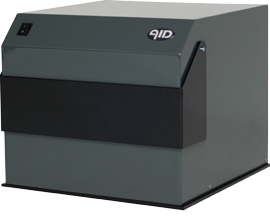 The AID iSpot Spectrum is equipped with a 7&1 filter wheel, which allows for a customized selection of up to 7 individual narrow band, hard coated fluorescent filters, whilst still allowing for our “one-click switch” to analyze enzymatic EliSpot assays on 96 and 384-well plates. 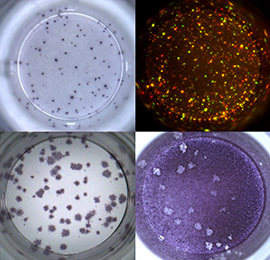 The insertion of a high resolution camera provides well images of unprecedented, fluorescence optimized quality. The “fluoroAID” image overlay technology permits exact detection of cells secreting multiple cytokines. Count results and all other parameters can be exported in various formats. 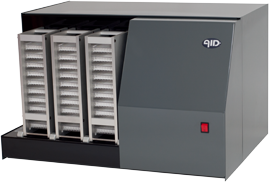 Designed for high throughput and traceable results. This is the ultimate tool for large groups of samples. The AID iSpot Robot copes with up to 30 plates in one automated, walk-away process and will analyze them in less than 90 minutes. 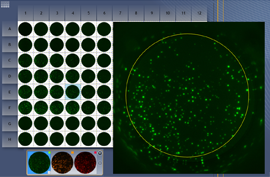 The system is designed to interpret enzymatic EliSpot assays as well as 1-, 2- and 3-color fluorescence assays. The AID iSpot Robot simultaneously takes high resolution images, auto centers the well, counts/analyzes the plate and exports data in various formats. Data acquisition is fully automated. Customized robotic AID Reader Systems are able to handle other plate formats or upscale for more plates per run on request. The AID vSpot (VSR07) extends the functionality of the successful AID Classic with full range plate compatibility. Due to a genuine optical zoom, versatile stage settings and unique software features this Reader is not restricted to the analysis of 96-well plate formats. It also reads 6, 12, 24 and 48-well plates. 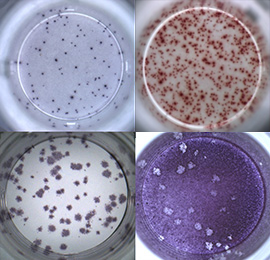 The AID vSpot analyzes a variety of different assay types including EliSpot, Viral Plaque Assays, Neutralization Assays and Colony Counting. The AID vSpot Spectrum is the new high-end EliSpot/FluoroSpot device from AID. 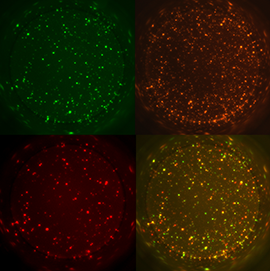 It combines different plate formats with the capability of reading fluorescence assays. 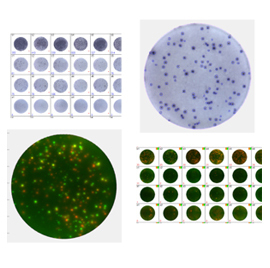 The AID vSpot Spectrum can handle a variety of different assay types including Viral Plaque Assays, Neutralization Assays and Colony Counting. Due to a genuine optical zoom, versatile stage settings and unique software features this reader is not restricted to the analysis of 96-well plate formats. It also reads 6, 12, 24, 48 and 384-well plates. The AID vSpot Spectrum is equipped with an 7&1 position filter wheel, which allows for a customized selection of up to 7 individual narrow band, hard coated fluorescent filters, whilst still allowing for our “one-click switch” to perform enzymatic analysis on different plate formats. The AID multiSpot fulfills probably all needs in a modern immunology lab. Equipped with a combined EliSpot/FluoroSpot module for counting and interpreting enzymatic as well as fluorescent EliSpot assays this device also comes with an automated microscope. The stage handles 96 and 384-well plates, up to 4 conventional slides or classical Terasaki plates. 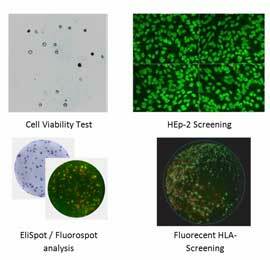 The software is adapted to EliSpot/ FluoroSpot assays, HEp-2 screening, Cell Counting, HLA-screening and many more applications.